Yet Another Take On "Do I Need an Agent?" Are you looking for a why-to-buy message for your newest product? Are you wondering why the message you created for an earlier product isn't working? 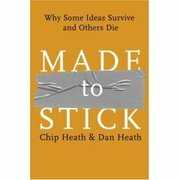 If so, you'll want to read Made to Stick by Chip Heath and Dan Heath. You might recognize the Heath brothers from their Fast Company columns which I mentioned earlier here. Every time I read one of their columns I learn something new and valuable. I figured their book must be just as good and I'm happy to report they didn't disappoint. The one key ingredient in this book that I loved the most was the wealth of hands-on, real world examples presented throughout. These not only helped the authors make their points but also made the book an enjoyable and memorable read...hmmm...sounds like they followed their own advice on the "concreteness" principle. The authors also take the time to show how their model maps to many of the stickiest ideas of all time. Clinton's "It's the economy, stupid" and the marketing power of Jared from the Subway commercials are two of the more well known examples. One of the more interesting stumbling blocks presented is what the authors call "The Curse of Knowledge." As they put it, "once we know something, we find it hard to imagine what it was like not to know it." 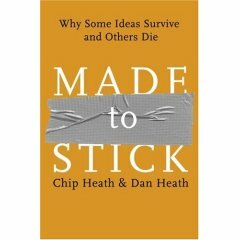 This issue not only gets in the way of presenting good ideas (because you're not putting yourself in your listener's shoes) but it's a classic problem associated with writing a good how-to book; all too often authors will write step-by-step information from the perspective of a knowledgeable expert, not a novice. This is another one of those rare books where a summary just won't do it justice. The 6 principles are important to remember but without all the examples and other background presented by the authors the principles won't be as meaningful or impactful. Regardless of what business you're in you'll find a lot of value from this book. And, because the authors have such a nice writing style you'll find it to be a very enjoyable read. P.S. -- How about that unique and memorable cover?! The neon orange makes it pop but the simulated duct tape really makes it "stick." The cover designers at Random House did a great job on this one. Simple yet very effective. I agree, it's a tremendous book.